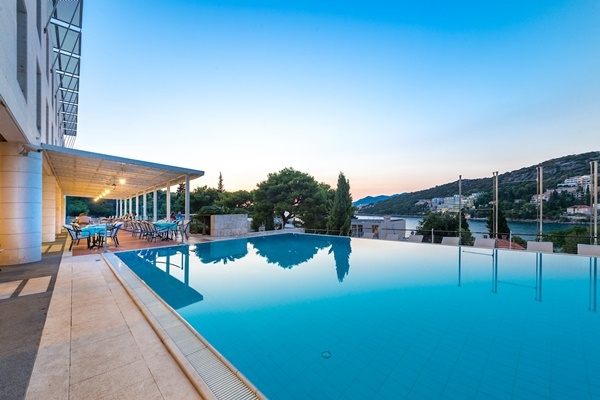 Hotel Uvala Dubrovnik is a newly opened hotel situated at the foothills of Petka overlooking the sea and Babin Kuk peninsula. This hotel is close to several beaches and shopping area of Lapad, where you can find wide selection of restaurants and bars. Hotel Uvala Dubrovnik provides 51 double-bedded rooms (12 have a beautiful view of the park and 33 have magnificent sea view). All rooms feature a balcony. Room amenities include satellite TV, en-suite bathroom, bathrobes and slippers, hair-dryer, mini bar, direct dial phone, air-conditioning, safety deposit box and Wi-Fi Internet access (surcharge). Restaurant "Mantala" offers a selection of meat, fish and macrobiotic dishes accompanied by a fine selection of superior domestic wines. The restaurant has a terrace with a view of Lapad bay and Elaphite islands. Guests are invited to visit the hotel's "Rozolin" bar, where they can enjoy pleasant conversations over a morning cup of coffee or relax with newspapers. From Hotel Uvala you can easily reach any beach along Lapad bay. The most popular beach is Lapad bay beach. This beach is located just a few minutes walk from the hotel. The hotel has an indoor and outdoor swimming pool. Wellness & SPA center of the hotel has 2 floors and is equipped with everything needed for the perfect body care and recovery including indoor and outdoor swimming pool, 2 whirlpools, steam bath, tanning bed, finnish sauna, infrared sauna, hydro-massage bath with aromatherapy, cardio-trim room, relaxation room and sun-bathing decks. Hotel Uvala provides 2 big conference rooms with capacity from 30 to 50 delegates. Meeting room "Perpera" can admit 55 participants. It is ideal for larger business meetings, press conferences and education seminars. The smaller meeting room, "Solad" can admit 30 to 35 participants, it has a more intimate atmosphere which makes it more suitable for smaller presentations and business meetings. From the hotel you will easily reach other areas of Dubrovnik by city buses. Just a few steps from the hotel there is a bus stop from which you can take bus no.4 to reach the Old Town (15 minutes ride). To reach the hotel from the airport you can prebook your private car transfer or take an airport shuttle bus to Pile Gate and change there for city bus no.4.